The slapaphone was made by eclectic instrument craftsman Jeff Fahringer, located in Pennsylvania. It consists of tubes that are open at the top, but closed at the bottom, and are hit with either paddles or hands. 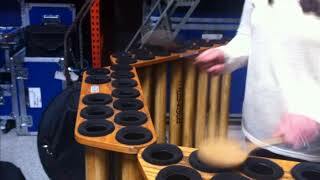 While it appears from the outside that the tubes are all the same length, they are stopped at different points inside (enabling them to be tuned to different pitches) and the stoppers are moveable for micro-tuning. Emil found out about the slapaphone and ordered them in the 1990s. He liked the sound, which was similar to boobams, and the idea of being able to combine both slapaphone and boobams together to create new textures. He also liked the versatility of the 3-octave range and its standard keyboard layout, which made fluency on this instrument not an issue.